Even if you’re not a serious photographer, a cute camera is an endearing addition to your accessory repertoire and gives you a reason to stop, smell, and snap the roses! Scroll down to see how fashion girls work a camera into their outfits, and be sure to shop our nine current favourites. Pair your camera with a printed mini for an incredibly charming outfit. 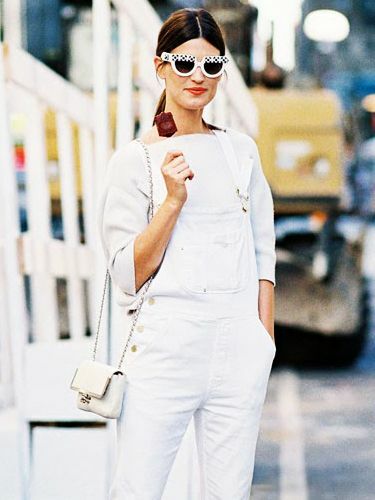 Attach a chain-link strap to your camera for an It-girl vibe. Headed to a picnic or brunch with friends? Accessorize a wrap dress with a straw hat, embellished sandals, and of course, a cute camera, for a ladylike look. If you’re ever in need of camera outfit inspiration, look to model and photographer Mustaparta for inspiration! Keep scrolling to shop the cutest cameras ever! Use this colourful strap to brighten up your camera. If you want to invest in a retro-inspired camera that will take fantastic photos, this is the one for you! This quirky cork gadget comes with two shutter speeds. For all of your memory-making needs. Fun fact: this camera was manufactured sometime between 1973 and 1975. Stash this little canvas camera in your purse for snap-happy moments. Is it too early to start making our holiday wish lists? ?No need to wait and upload your photos to a computer—this camera instantly prints them out. Snag this limited-edition vintage Polaroid camera before it disappears! Do you like taking pictures? Share your favourite camera in the comments below!